A thirteen part / thirty minute per episode television program. Four young adults in their 20’s from different parts of the United States have never left their hometowns. They visit El Paso, Texas and the Borderland for the first time. Each has a different story to tell. 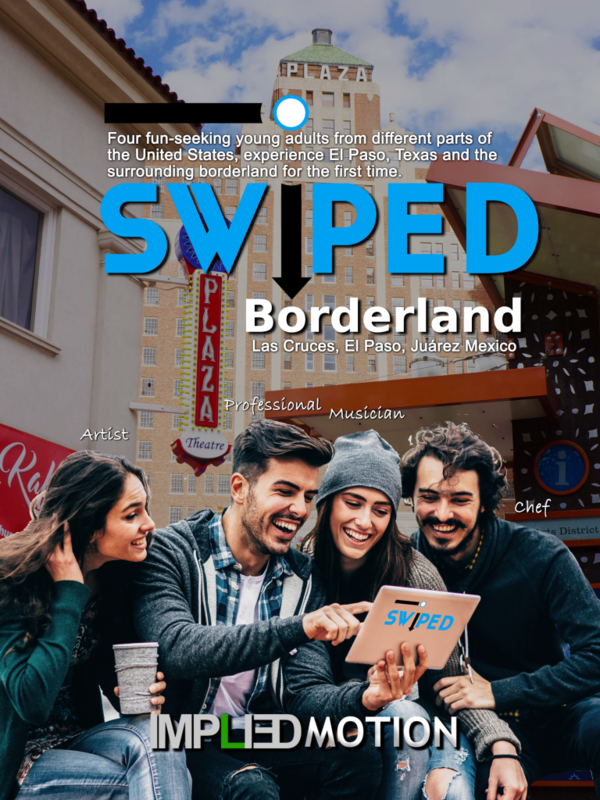 In the spirit of CNN’s “United Shades of America with W. Kamau Bell” and other travel reality shows, Swiped: Borderland highlights some of the most entertaining and exciting aspects of El Paso, Texas, Juárez, Mexico and Las Cruces, New Mexico. This is NOT your regular documentary-style TV program. Swiped: Borderland is a 30 minute episodic program which will be broadcast on PBS KCOS. It will be shown at least three time with an average viewership of between 50-100 thousand viewers in El Paso, Texas. This does not include people watching it from Mexico, online or in other regions. Each episodic will be broken down into four – 5-minute segments. The business person will focus on new developments in the area, the openings of new businesses as well as Chamber Events. The Musician will focus on the local nightclub and music scene. The Artist will visit historical places, museums and local artists. The Gourmet chef will visit some of the hottest restaurants. There will be two edited versions of each segment. For the 30-minute episodic for broadcast the segments will be interspersed together to create a more fun and diverse program. For online broadcasting, the segments will be feature only one person and story for the entire 5 minutes. The four individuals will be hosted locally for 2 weeks and in that time, will have the opportunity to visit many parts of the Borderland creating multiple segments which will be then edited into numerous episodic programs and individual segments. Once the 2 weeks are completed they will be asked to come into a studio setting in El Paso, Texas to talk about their most interesting, fun or memorable experiences as well as highlight some of their misconceptions about the local area. This in-studio segment will consist of 2-3 minutes at the end of each episodic and will be hosted by a prominent TV/film actor. The idea of this series is to showcase fun events, locations and people of the Borderland to young and old generations using energetic personalities who will provide honest feedback about their first experiences to this local area. * Where is the best Mexican food? * Tired of Mexico food? What about other food? * What place has the best atmosphere? * Where is the most entertaining bar location? What time is the best time to go? * Where can I get the best local flavor? * Lets visit the farmer’s market and try local produce. * Where are best places to hike or bike? Waco Tanks, Trans-mountain? * Where can I get the best views of El Paso? * Where can I see a local football or baseball or basketball game? * Where can I see local artists and culture? * Where can I see historical buildings and churches? * Are there reenactments I have see and take part of? * Where can I see plans for new development in El Paso? * What new buildings are being built or in the middle of development? * What new places have opened up in the past 6 months? * What new unique businesses are being formed in El Paso? * What makes El Paso businesses unique and renown throughout the World? Please contact us for more information on this film. find out about or amazing work in virtual reality production. Ask for demos of our latest video virtual reality projects in 360 and 360 3D. (C) Copyright. All Rights Reserved. Implied Motion.